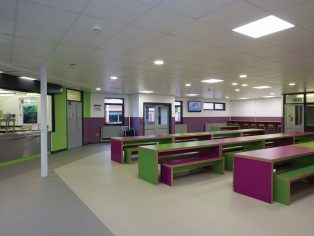 A combination of Polyflor’s Polysafe Verona PUR vinyl safety flooring in two complementary and stylish shades has been used to help create an eye-catching dining hall for pupils at The Sutton Academy in St Helens. As part of a major refurbishment project at the school, over 400m2 of Polysafe Verona PUR flooring was installed throughout the dining and seating areas where pupils relax and have fun during break times. 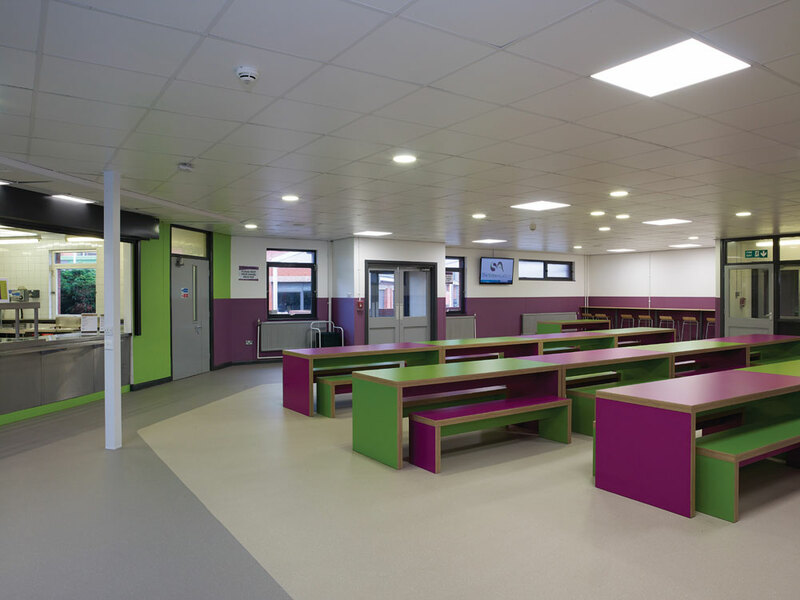 Verona flooring in Biscotti 5212 and Dolphin Grey 5203 shades was used to create a neutral backdrop for the dining hall’s vibrant purple and green benches which tie in with the Academy’s branding colours. With virtually invisible carborundum-free safety aggregates and tonal decorative chips, Polysafe Verona has the look of smooth vinyl flooring combined with the performance of a safety floor. Featuring Polyflor’s renowned PUR cross-linked and UV cured polyurethane reinforcement, Polysafe Verona flooring can be easily maintained with a simple cleaning regime. Verona flooring is HSE compliant and fulfils the EN13845 European Standard for safety flooring as it provides sustainable wet slip resistance in high traffic environments throughout its guaranteed lifetime. With a surface roughness of 20 microns and above, the Verona range achieves 36+ on the Pendulum wet test and meets the 50,000 cycles abrasion test standard. Verona samples can be ordered free of charge on the Polyflor website or by calling the Polyflor Samples Direct Hotline on 0161 767 2551. Polysafe Verona flooring contains recycled content and is 100% recyclable through the Recofloor vinyl take back scheme.